There will be two screenings of the Danny Way documentary “Waiting for Lightning” at the Vue Omni Cinema in Edinburgh on Sunday 30th June and also on Tuesday 2nd July. An epic journey. An impossible dream. The birth of a legend. The much anticipated feature length skateboard documentary about skater and stuntman, Danny Way drops-in on the big screen from the 23rd June. It’s your exclusive chance to see the movie as it makes its way to select cinemas in the UK for a limited time only! ‘Waiting for Lightning’ is the first feature length skateboard documentary to combine the history of skate and Danny Ways iconic career. Dropping in at cinemas around the UK for a limited run, it’s your chance to see the highs and lows of one of the most iconic skaters in the world on the big screen. The movie features unseen footage of his infamous jump over the Great Wall of China plus new edit from his Hawaiian mega ramp. Witnessing Danny Way’s stunts and story at the cinema is an opportunity not to be missed by skaters and all! 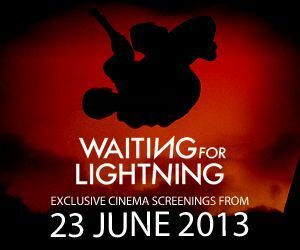 As well as dropping in at a cinema near you, Waiting For Lightning will hit skate shops around the UK for exclusive screenings. Follow on Instagram for exclusive content and giveaways @WaitingForLightning.